Why Am I Still Here? whyamistillheredotnet.wordpress.com | Because God loves me and has a wonderful plan for my life. Shirley Faith Touchstone has been on an amazing journey since her son, David, and her husband, Barney went to their heavenly home. After the loss of her husband, Shirley asked herself, “What now?” She realized that God was leading her to present something to help people discover why they ARE here and what their purpose is here on earth. Can they be useful no matter what their physical condition? Shirley’s answer is that we are never too old to serve God. Read (Psalm 92:12–14). She recently heard someone say, “We retire from our life’s work, but we should never retire from serving God.” Being a believer is a lifelong commitment to our Lord and Savior, Jesus Christ. 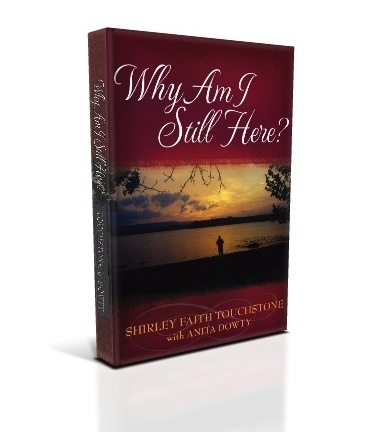 A part of the answer to Shirley’s question, “What now?” is this book, “Why Am I Still Here?” Many people have shared their stories to be included in this book. Find one that you can relate to and realize that you are not alone in keeping your story hidden from the world. Anita, Ashley has had a new baby boy. I received my copy of the book and just want to say, it is as beautiful inside as it is outside. Easy to read collection of testimonies and examples of how people cope with loss and why they think they are “still here”. Very moving and personal stories and insights into how people can and do go on after extreme tragedy, loss or sadness. Shirley Touchstone uses her own experiences, combined with those of others, to help spread the good news that we are not alone in this world.